“Thanks to this archiving project I learned to disseminate and preserve historical information from a center that for 25 years has been pivotal in the formation of Latin American, Latino and Chicano research at UCSC,” says LALS major Alma Villa, who helped preserve the CLRC legacy through the center’s apprenticeship program. Included in the archive was a detailed report by late professor Lionel Cantú about the impressive skills and strengths of the students he proposed to mentor via the CLRC’s Undergraduate Research Apprenticeship Program. “It was right under our noses,” says Catherine Ramírez, director of the Chicano Latino Research Center (CLRC) about Nuestras Historias, the center archive that will open to the general public November 30 with a student-curated exhibition and reception at McHenry Library. When Ramírez took the helm of the CLRC in 2013, one of her tasks was to reorganize the center’s office space. Little did she know she was about to unearth a treasure trove of materials. For most of 2012, the CLRC had been closed due to budget cuts. What was once a vibrant hub for Latin American, Latino, and migration studies had been dormant and its offices in Casa Latina at Merrill College had become a haphazard storage space, packed with over two decades of forgotten about CLRC items. Over the years, no one dared throw anything out. At first, its contents seemed unassuming: colloquium programs were stuffed in dusty drawers, posters were layered over older posters in cheap picture frames. Cassettes, VHS tapes, and floppy discs were stacked in the corner. There were vast supplies of printed media like newsletters and working papers stored in countless binders. 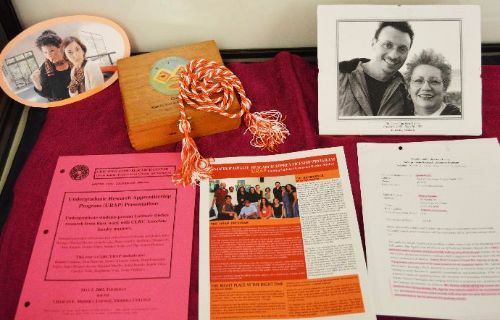 Some of the items Ramírez and her team of students found dated back to the program’s establishment in 1992, including the original proposal. As Ramírez sifted through the center’s materials, she quickly realized that she had unearthed a rich legacy of campus history and scholarship. “I can really see the evolution of a discipline and how UC Santa Cruz was at the vanguard in the fields of Latin American, Latino and migration studies,” reflects Ramírez, also a professor in the Latin American and Latino Studies Department, about the collection. 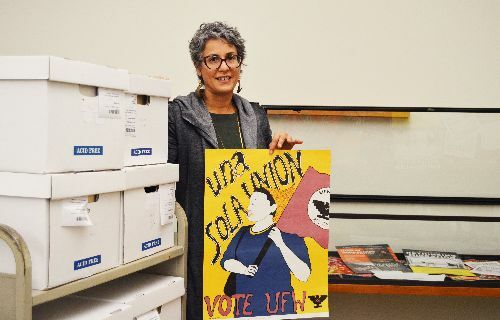 There were beautiful hand painted posters, original pieces of artwork, colorful photo albums, including an undated photo of labor activist Dolores Huerta with UCSC students. There was correspondence between scholars and glowing recommendation letters from committed professors like the late Lionel Cantú. “The past presence and level of staff support are remarkable in and of themselves,” says Ramírez. Some of the files contained intimate minutiae of everyday life at the research center: random and detailed meeting minutes, carefully taken by staff who noted who arrived late, who doesn’t respond to email, and what dishes faculty affiliates brought to events. Ramírez was both mesmerized and at a loss: she did not know what to do with what she uncovered. To Latin American and Latino studies professor Sylvanna Falcón, it was the textbook definition of an archive: a collection of historical documents or records that provide information about a place, institution, and group of people. “Archives tell a story, and those stories are waiting to be discovered through our research,” says Falcón, who recommended Ramírez reach out to the university library to preserve the CLRC’s contributions to both the campus and scholarly community. Ramírez also saw a unique opportunity for students to learn the tools and methods of historical research. 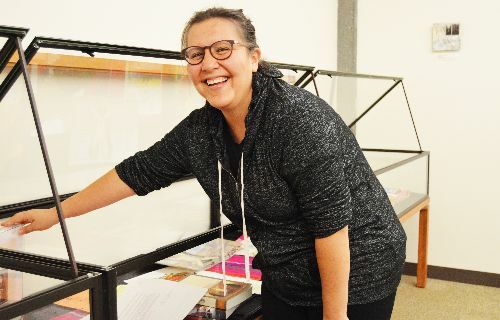 Thanks to the help of the university library’s Special Collections and Archives team, UCSC faculty guidance including Latin American and Latino studies professor and former CLRC director Gabriela Arredondo, and a small group of dedicated students, the CLRC archive Nuestras Historias came into being. Leading the archival project was Alina Ivette Fernandez, a graduate student in the Latin American and Latino Studies Department. “After the decision was made to create the archive I walked into the CLRC and looked around at nearly 25 years of history,” remembers Fernandez. “I sat down, suddenly exhausted, and thought ‘where do we begin?’ We got through it page by page, pile by pile, box by box. At times it seemed never ending, but we made jokes, played music and got through it together,” adds Fernandez, who was joined by undergraduate students from the center’s Undergraduate Research Apprenticeship Program (URAP): Cynthia Murillo, Alma Villa, Vicente Lovelace and Esteban Adame. Over nine months, the students put the archive into order: items had to be sorted, labelled, scanned, filed, indexed, and in some instances, deaccessioned. In total, 27 boxes and three oversized folders were sent to McHenry library, where the collection is now stored. For 25 years, the CLRC has provided scholars the space to study cultures, societies, people, and institutions of the Americas in innovative and interdisciplinary ways. “My hope is that these materials will be used to spark new ideas, inform research projects, highlight policy precedents, excite others about the work of the CLRC, and show the value of the academic, professional and social community it actively creates,” says Fernandez. “It is remarkable by how much the CLRC has accomplished. The archive conveys that it takes a few committed people to create something great,” reflects Falcón. Campus archivist Teresa Mora was also impressed by what the CLRC was able to do with very limited resources. Also in the archive are powerful oral histories. Ramírez realized that many items needed a context and she suggested that students interview the CLRC’s key players about how the center was established and grew. So, under the supervision of Arredondo, students gathered testimonies from the two CLRC co-founders, Norma Klahn and Pedro Castillo and one of its earliest directors (and UCSC alumna), Dr. Olga Nájera-Ramírez. “Through reading memos, faxes, and emails I realized that as time passed, the CLRC was called upon to do more with less,” adds Fernandez. “Speaking to past directors and learning about comparable centers on other UC campuses, I learned the CLRC's survival is a testament to the tenacity of its leadership and community,” says Fernandez. The CLRC is also hosting a free, public reception at McHenry Library, Room 4211 on Thursday, November 30 from 4–6 p.m. to launch the archive and celebrate the history and future of the CLRC. Registration is recommended. More information can be found on the CLRC website.